Since the series of Twilight books and movies have grown so popular, a lot of women are asking for a ring like Bella's Twilight wedding ring, which she receives from Edward Cullen in Eclipse. According to the story, this ring belonged to Elizabeth Masen, Edward's biological mother, and it is meant to be a bit vintage looking. Edward presented this token of immortal love to Bella in a black satin box, so if you are presenting it to someone you love, you may want to follow suit. This ring is described by the writer, Stephanie Meyer, as follows: "The face was a long oval, set with slanting rows of glittering round stones. The band was gold - delicate and narrow. The gold made a fragile web around the diamonds." Since the description is a little big vague, jewelers have different interpretations on exactly what this ring looks like. If you want a ring that is exactly like the one Bella wears in the movie, you may be out of luck. The officially licensed replica ring is no longer available for sale and there are no plans to restart production of it. You may be able to find it on an auction site like ebay or perhaps at a flea market. However, there are other similar inspired-by versions available. Amazon: Amazon sells a variety of ring styles, many with cubic zirconia, that are modeled after the ring from the movie. Styles include the Bling sterling silver and CZ ring with many crystals and the Beaux Bijoux silver plated and CZ ring, which has more of a web ring design. Inspired Silver has a ring that is a little bit of a different take. Instead of a larger stone in the center, this ring has seven cubic zirconia of the exact same size in a hexagon pattern. The hexagon is surrounded by a large circle encrusted with additional cubic zirconia. There is also cubic zirconia on the band. The ring itself is sterling silver. It has a rhodium finish and a carat weight of 1.5. 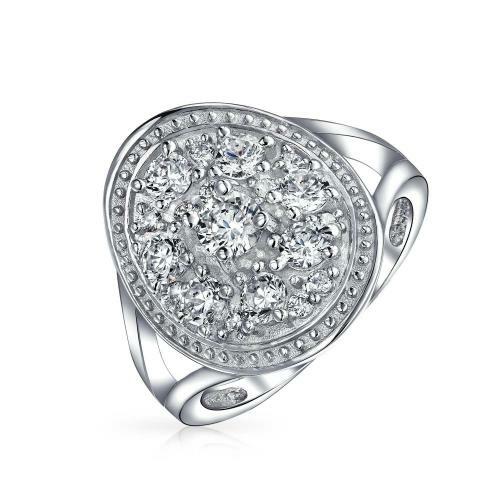 Eve's Addiction: This simple and affordable CZ ring ring has a pave setting and an oval design. Emitations sells a ring with cubic zirconia in the center and a web plated in gold. There is also a silver plated version. The split band connects to the narrow edge of the oval to allow it to fit comfortable. This is one of the few places that sell the ring in gold. If you are looking for a more authentic style, you may want to choose this one in the gold tone style. The LilMiss Sparkley shop on Etsy carries a made-to-order Swarovski crystal ring inspired by Bella's engagement ring. It has a large center stone and many smaller crystals, making it a more brilliant design than some of the other versions of the ring. The Quiet Witness, an Amazon storefront, carries rhodium-finish and gold-plated rings with Swarovski crystals. If you want a ring from the movie similar to Bella's and can't find what you like online, you can try small jewelers or local jewelry artisans to create a custom ring based on the design. You could try bringing a still from the film to a jeweler to show the idea. Keep in mind, however, that he or she may or may not agree to reproduce a copyrighted design. Fans of the movie may want to wear a ring like Bella's to show their love of the film, or to capture the romance it represents. The symbol of eternal love it portays, combined with the beauty of the ring style, make it a wonderful and unique choice in jewelry.